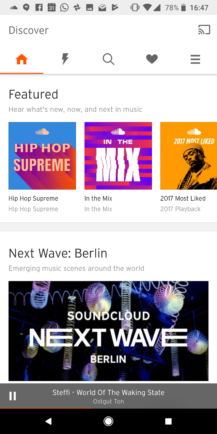 The new home experience is headlined by personalized playlists such as 'More of what you like' and 'Artists you should know,' which are automatically created based on your listening history. Below those you'll find a new 'Featured' section, bringing you playlists exploring what's hot in two key music scenes right now. 'Hip Hop Supreme' for rap tracks and DJ set playlist 'In the Mix' will be added to on a weekly basis to keep you up to date. 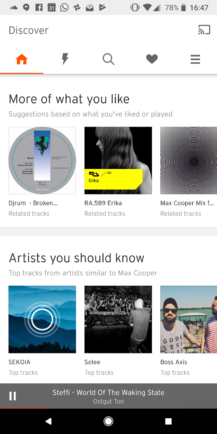 Left and center: new personalized and featured playlists. Right: Your stream is now in a new 5th tab. 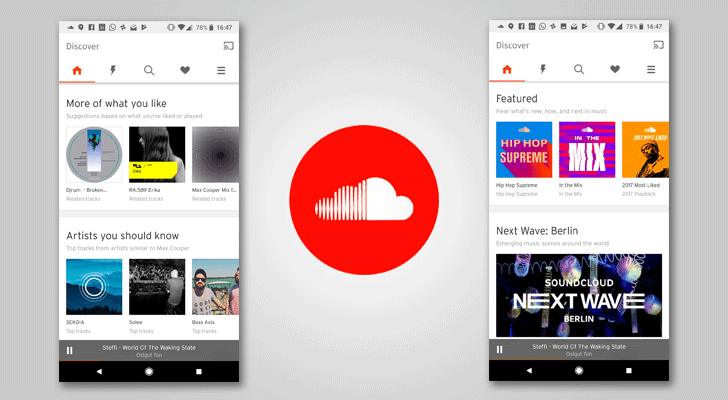 Recently added discovery tool 'The Upload' will also feature prominently on the home screen, serving up a playlist of new music according to your taste. US users will be able to check out the latest album launches with the 'Fresh Pressed' list, and there is also a location-specific top 50 chart available to everyone. Last but not least, Next Wave (Berlin, pictured above) and Playback will look at emerging artists while focussing on popular genres in certain parts of the world. 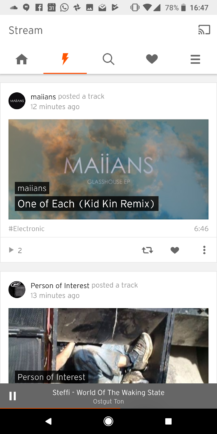 I've gone back through the last few versions of the SoundCloud app, and the new homescreen is present on them all. That suggests a server-side switch is responsible for these changes, so you shouldn't need to update the app to get the new experience. That said, a new version was released on the Play Store and uploaded to APKMirror a few days ago, so it can't hurt to grab it if you haven't already. If you haven't got it yet, don't panic as it will take time to roll it out across the globe.